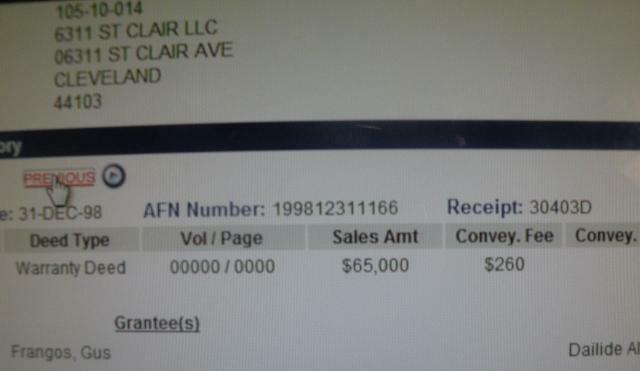 CUYAHOGA COUNTY LAND BANK - & CLEVELAND COMMUNITY DEVELOPMENT 'gifts' to JASON BROOKS- Connection? City of Cleveland employee? 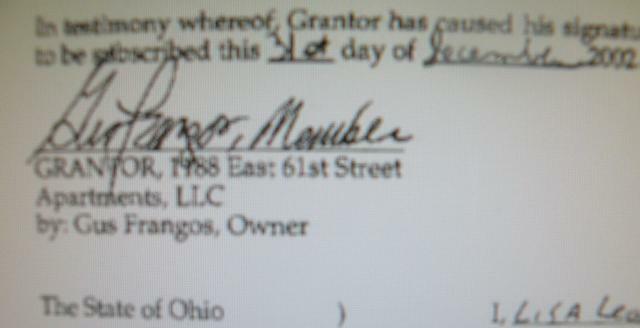 Cuyahoga County Land Bank- Gus Frangos President Con Artist? JESUS!!!! 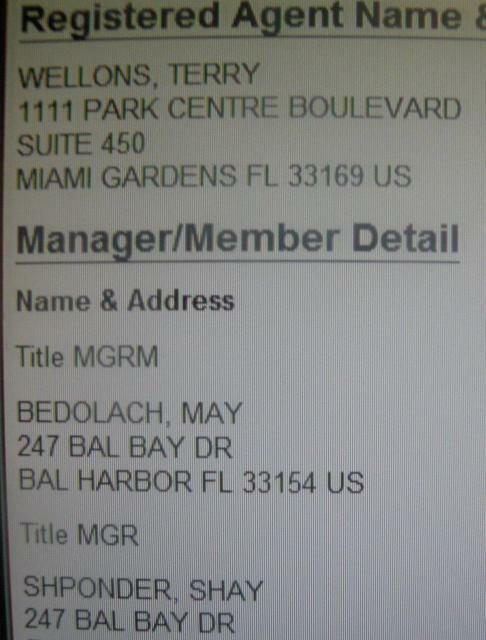 DAVID W SCHWARTZ -- Woods Cove Tax Liens - KING OF VULTURE CAPITALISM - It runs in the family!! Submitted by Gone Fishin on Tue, 03/05/2013 - 19:46. Attorneys seeking Safeguard Properties 'Whistleblowers". Use our website to set up a confidential, free initial consultation on your case. We have experienced whistleblower attorneys who are prepared to discuss your claims and help you determine the best way to protect your rights throughout the legal process. The City of Cleveland has announced major plans for the Slavic Village area in Cleveland, Ohio. The county land bank will team up with Safeguard Properties, Forest City Enterprises, Neighborhood Progress, and Slavic Village Development to create Slavic Village Recovery LLC. According to the Plain Dealer, Neighborhood Progress and Slavic Village Development expect to sign an operating agreement this week with Forest City and Robert Klein, Safeguard's founder and chairman. The nonprofits each will own 10 percent of Slavic Village Recovery LLC, with the rest split between Forest City and Klein's RIK Enterprises LLC. 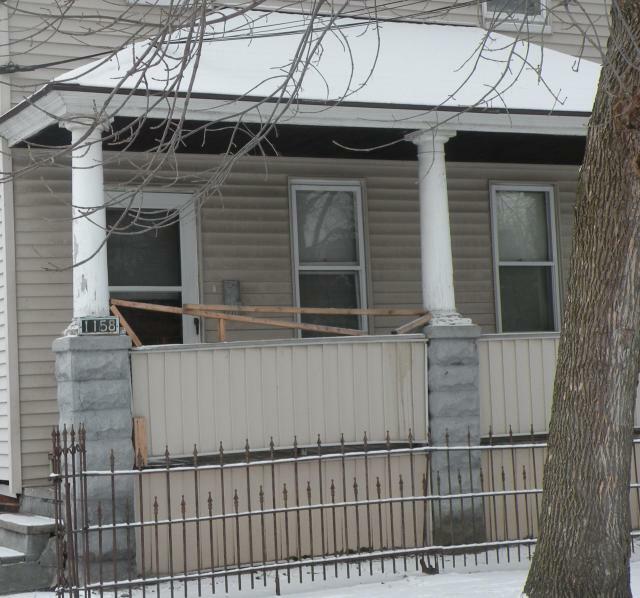 Slavic Village Recovery intends to acquire 50 vacant houses in the Slavic Village area - and could tackle HUNDREDS more- with the intention of acquiring the property for free and then renting or selling the property. Klein believes lenders will give away those troubled houses, starting in Slavic Village, to get the burden off their books. Klein's goal: Get a house for free or for very little money. Invest $40,000 to $50,000 in renovations, using Safeguard's national network of contractors to lower the cost. Then sell the house for $60,000, turning a small profit and providing affordable housing in a city neighborhood. Slavic Village Recovery LLC will also work with the county's land bank to acquire some of the property that the land bank has hoarded for such an occasion. Safeguard Properties should have no problem lowering the cost by using their own contractors since they don't like paying their contractors after the work was performed. 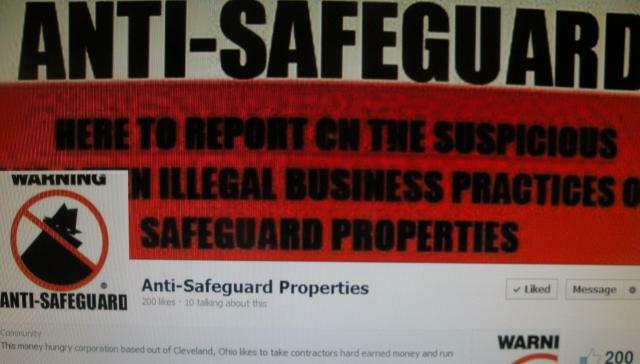 Safeguard Properties is well known across the country for ripping off their contractors after their work was completed. 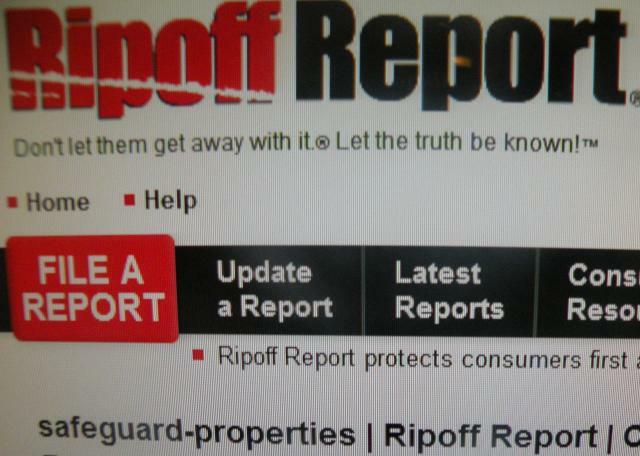 If you google 'Safeguard Properties Complaints Lawsuits" you will find hundreds and hundreds of complaints and lawsuits. Another major complaint regarding Safeguard Properties is with contractors entering occupied homes that are in the beginning stages of foreclosure. Contractors are hired in an attempt to secure these properties and protect the mortgage holder's interest. Property owners across the country come home to their still LEGALLY owned and occupied homes , only to find locks changed and personal items stolen. No foreclosure was even granted in court. 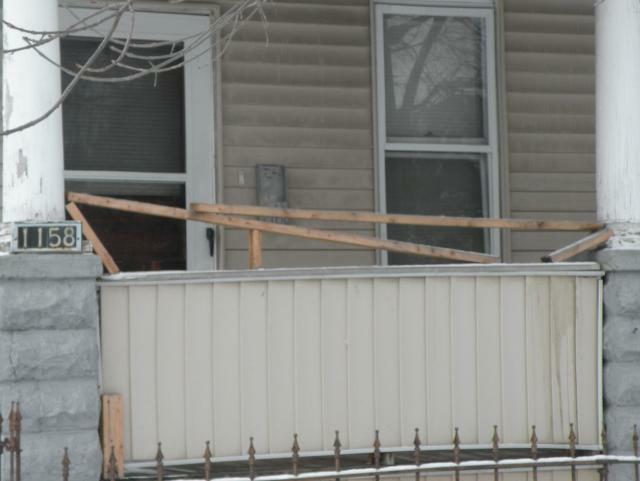 Some homeowners were completely wiped out by these thieves. THOUSANDS of property owners have complained about this issue. Safeguard has been working with the county land bank for years and has received tons of federal funds. It is no surprise to read about the County Land Bank's willingness to give this company property that the county land bank has hoarded from other possible investors. Again, another selective beneficiary of taxpayer property. Meanwhile, Gus Frangos - President of the County Land Bank - has engaged in very suspicious activity regarding real estate in Cuyahoga County. It is my opinion that Gus Frangos has engaged in MORTGAGE FRAUD. Gus Frangos has purchased property in his own name, transferred the property into numerous self-created LLCs, received large sums of money via mortgages, failed to pay his property taxes, collected rent money, and then he failed to pay the mortgage. I believe that Gus Frangos had no intention of ever paying the mortgage and hid the property behind the self-created LLC while collecting rent money. Gus Frangos has several foreclosure cases filed against him and his self-created LLCs. 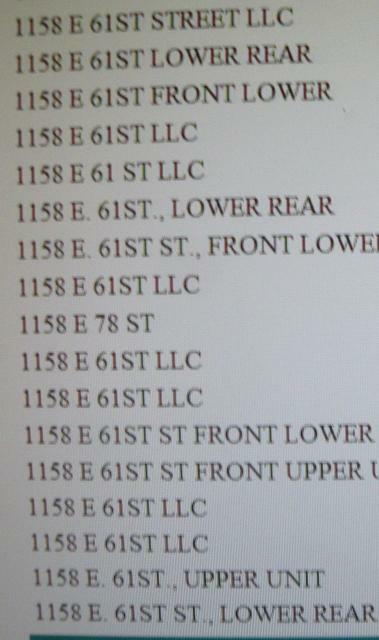 One property tax foreclosure regarding property located at 1158 East 61st Street and owned by Gus Frangos' self-created LLC ( 1158 East 61 LLC) was recently foreclosed upon and will soon go to sheriff foreclosure sale. 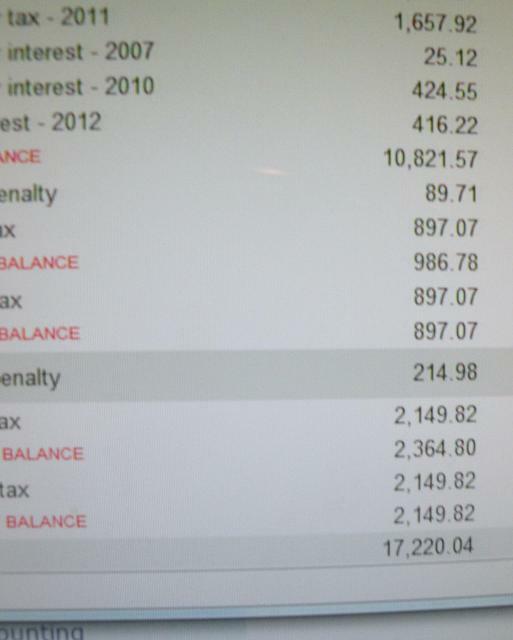 Despite collecting rental income for years, the large loan and delinquent property taxes in the amount of $17,220.24 were never paid. 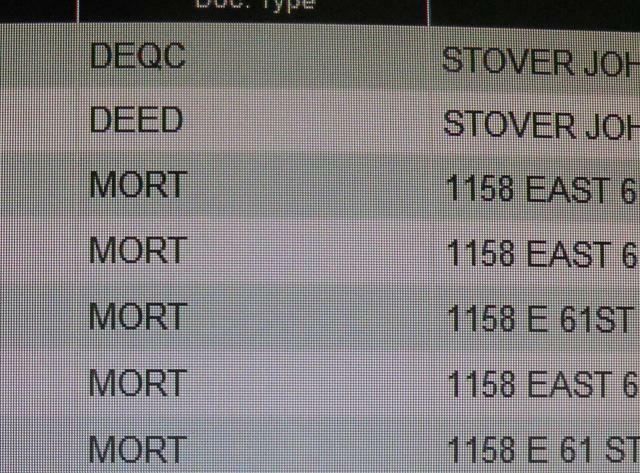 According to county records, 1158 East 61 owes $17,220.24 in delinquent property taxes. Ohio Revised code sections 5721.30 to 5721.43 permits the Cuyahoga County Treasurer to sell tax lien certificates on parcels that have delinquent taxes. The Treasurer’s Office has full discretion to select and remove certified delinquent parcels from the Tax Certificate Sale. Gus Frangos was the primary drafter of Ohio’s House Bill 294 and S.B. 353 establishing enhanced-capacity County Land Banks, and expedited administrative tax foreclosure policy. In September 2004, Mr. Frangos was retained by the Cuyahoga County Treasurer to craft legislation to help expedite the tax foreclosure process, specifically on vacant and abandoned properties. County and city officials, and others have ignored my complaint made in August 2012 regarding Gus Frangos and his highly suspicious property transactions. They can not say they were not warned when I take my complaint further down the road. It is a major conflict of interest to have the PRESIDENT OF THE COUNTY LANDBANK engaging in such activity that has resulted in unpaid delinquent property taxes and foreclosures. And giving property to Safeguard Properties is another scam- at taxpayer's expense. Submitted by Gone Fishin on Wed, 03/06/2013 - 08:02. If you have read this blog and agree that something is really wrong with Gus Frangos and the Cuyahoga County Land Bank, and you are sick and tired of the continued corruption and con games played in this area, please help me spread the word. I am spending countless hours researching these thieves to the point of seeing con artist, LLCs, parcel numbers and addresses in my sleep. I have contacted numerous people myself, but I need help with others passing this information along as well. FLOOD their offices with complaints. PLEASE do your part and pass this information along to others. If you are able to help pass the word, please keep a log of who, what, where and when as this information will be needed when I call the FBI again to request a meeting and when I travel to Washington DC and refuse to leave until this issue is addressed. Submitted by Gone Fishin on Wed, 03/06/2013 - 19:53. Jeff, I can't post here. I just spent an hour uploading information and it came out scrabbled twice. All of the photos and words are all messed up in the blog, but they are not this way when I hit submit?? Submitted by Jeff Buster on Wed, 03/06/2013 - 22:15. Nothing has changed on Realneo back end....perhaps, if you have cuts of content from other urls, that there is conflicting code coming over into the Realneo Drupal software. That is usually the reason for spastic response when you hit submit. One way to strip out foreign code is to paste content into Word, and remove all hidden code. Then take the Word doc and put it into Realneo. What ever you have done in the past also clearly works. Submitted by Gone Fishin on Thu, 03/07/2013 - 08:06. 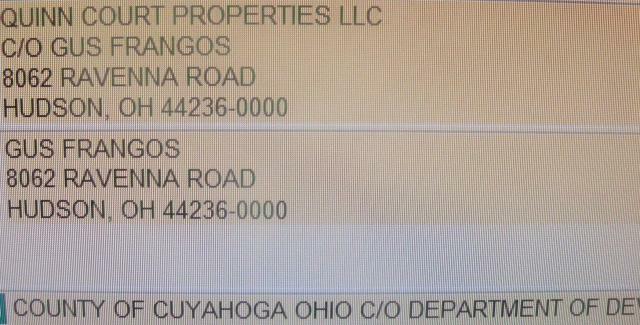 Keep in mind that Gus Frangos is the President of the Cuyahoga County Land Bank. He is in charge of taxpayer's property, yet he can not even manage his own property- hidden behind numerous LLCs. Frangos is in charge of saving us from the foreclosure crisis. Frangos has also introduced and passed legislation to speed up the foreclosure process for delinquent property taxes, and he was actively involved in the sale of delinquent property tax liens to predatory tax collectors. Gus Frangos purchased the above property located at 6311 St Clair Avenue. 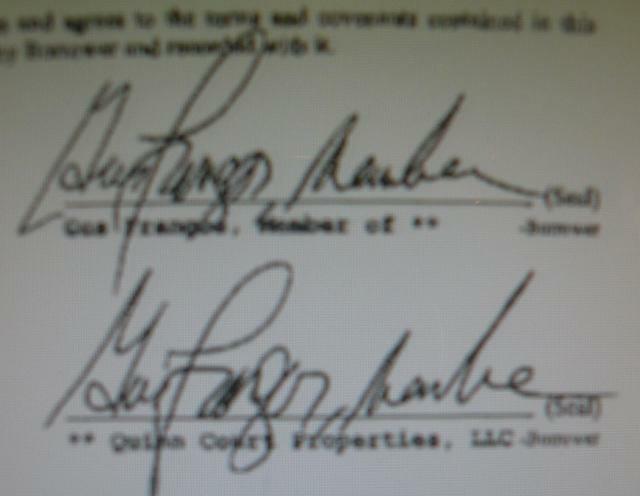 Gus Frangos transferred the deed into his name. 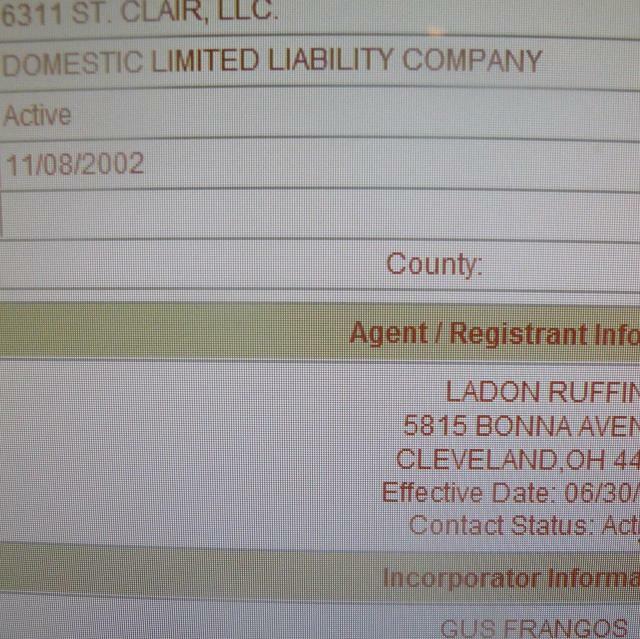 Gus Frangos incorporates 6311 St Clair LLC and names Ladon Ruffin as his agent. Gus Frangos signs a mortgage loan for $98,231.00 and agrees to be 'individually responsible' for repayment of the loan given to 6311 St Clair LLC. Gus Frangos hired agent, Ladon Ruffin, is responsible for collecting and handing over rental income for 6311 St Clair and several other Gus FRangos' self-created LLCs. This property has four rental units and generates a minimum of $1400 per month in rental income. Despite collecting rental income for the several rental units at 6311 St Clair, Gus Frangos failed to timely pay his property taxes and is delinquent for years. Despite the years of delinquency, this property was never sold out to predatory tax collectors via the delinquent property tax lien sale - while other property owners that owed considerably less in delinquent property taxes were sold out repeatedly. Some of the other less connected property owners only owed a few hundred dollars in delinquent property taxes prior to being sold out to the predators. 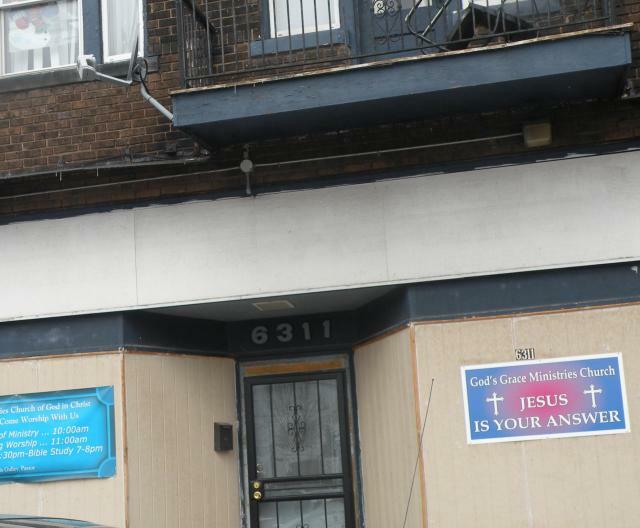 As a matter of fact, the Cuyahoga County Treasurer's office once filed a delinquent property tax foreclosure against a mentally ill man- working in connection with others in an attempt to steal Frank Giglio's property. Frank Giglio owed $182.50 in delinquent property taxes at the time- less than the $500 minimum necessary to file a property tax foreclosure, yet they filed the case anyway. After much public outcry, my threat to put my foot up their corrupt asses, and the assistance of one of the only real reporters in this area- Mike Gill from Scene Magazine, the case was eventually dismissed. Despite collecting rent from the several units, Gus FRangos failed to repay the mortgage loan relative to 6311 St Clair and the lender files a civil case naming 6311 St Clair and it's hired agent, Ladon Ruffin. A judgment 'by confession' was obtained in this civil case for $87,612.31 relative to defendant 6311 St Clair LLC and it's agent Ladon Ruffin. The lender realizes that a judgment against 6311 St Clair LLC and it's hired agent Ladon Ruffin is worthless. The lender files a lawsuit naming Gus Frangos - who agreed to be 'individually responsible' for the loan. The lender and Gus Frangos reach an agreement - details unknown - and the lender files to dismiss the case against Gus Frangos. The judgment remains against 6311 St Clair LLC. 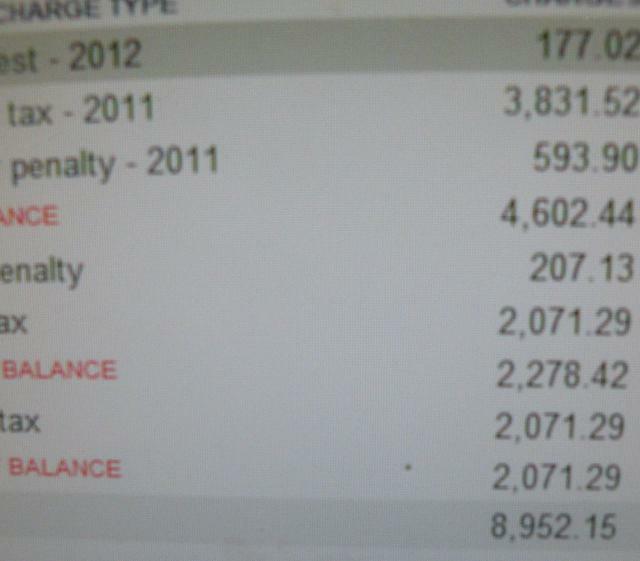 The delinquent property taxes have not been paid. Submitted by Gone Fishin on Sun, 03/17/2013 - 19:53. FIGHTING OVER COUNTY TAX PAYER'S PROPERTY. Making deals with out of state investors in a coffee shop. Northwest Mechanical received three properties from the county land bank and two properties from Kamms Corners Development. The writer of this blog also mentions Jason Brooks- who is the agent for Two Aces LLC. "On 02/07/12 – Without my knowledge and in breach of contract,18801 Rockland Ave.was transferred TWICE, first from the Land Bank to Northwest Mechanical. Public records indicate that two hours later the property is sold by Northwest Mechanical to Joeseph Rose for $64,400.00 via Quit Claim Deed, without a participating title agency or Purchase Contact of record. The gross profit is $64,400 – $10,731.55 = $53,668.45." Con Artist GUS FRANGOS is a screw job and needs to go. The following statement has been recorded with the Cuyahoga County Fiscal Office relative to both properties sold by the Cuyahoga County Land Bank. My Experience With Jeremy Ennis and North West Mechanical in Cleveland OH Ripping Me Off. 10/18/11 – Jeramy Ennis, Jason Brooks and I (Peter L. Brady) meet with Angela Whitaker and Ian Ahern in the Cuyahoga County Land Bank office for the purpose of purchasing property. At the meeting, Jeramy Ennis authorizes a Deed in Escrow contract on two properties 18801 Rockland Ave.Cleveland, OHand 4487 W. 149thCleveland,OH. Jeramy states to Ms. Whitacker that the two $5000 deposits will be wired from him the next day. 10/19/11 – Jeramy Ennis contacts Ms. Whitaker informing her of a delay in funds transfer. 10/19/11 – Jeramy Ennis and Theodore Ennis of Northwest Mechanical, Inc and Peter Brady representing SARTRE, LLC (CA) enter into a verbal agreement in a coffee shop. 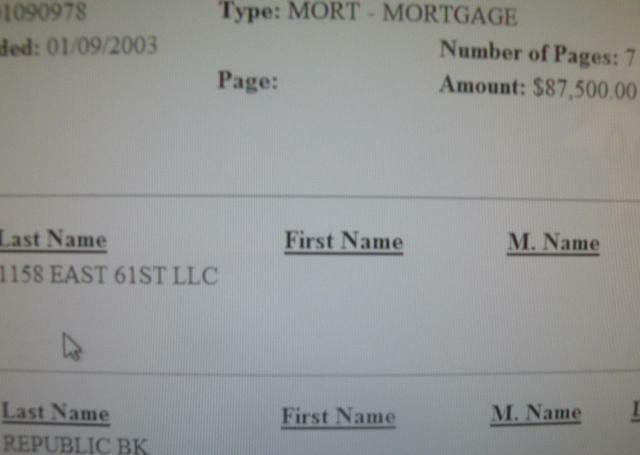 10/21/11 – $1,442 received to Neighborhood Action Partnership, LLC from Northwest Mechanical, Inc per agreement. 10/21/11 – On behalf of SARTRE, LLC, and Name of Neighborhood Action Partnership, LLC OH, Peter Brady transfers two $5,000 deposits to Thoroughbred Title Agency for the purchase of 18801 Rockland Ave.Cleveland, OHand 4487 W. 149thCleveland,OH. These wires are acknowledged by Annette R. Rodriguez and Escrow officer Lynn Wolski of Thoroughbred Title Agency. Angela Whitaker, Ian Ahern, Jason Brooks and Jeramy Ennis are all cc’d on correspondence. 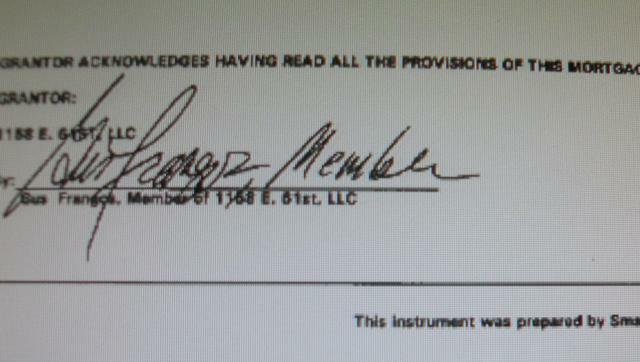 11/02/11 – Jeramy Ennis faxes to SARTRE, LLC (CA) a ratified and notarized copy of “The Agreement” stating SARTRE, LLC (CA) owns 88% of each home and that when the Deed is transferred from its owner it is to be vested in the Name of Neighborhood Action Partnership, LLC OH and the homes will be jointly owned. 10/21-12/16/11 – Neighborhood Action Partnership, LLC OH invests and additional $7,802.89 in materials through direct payments to vendors. 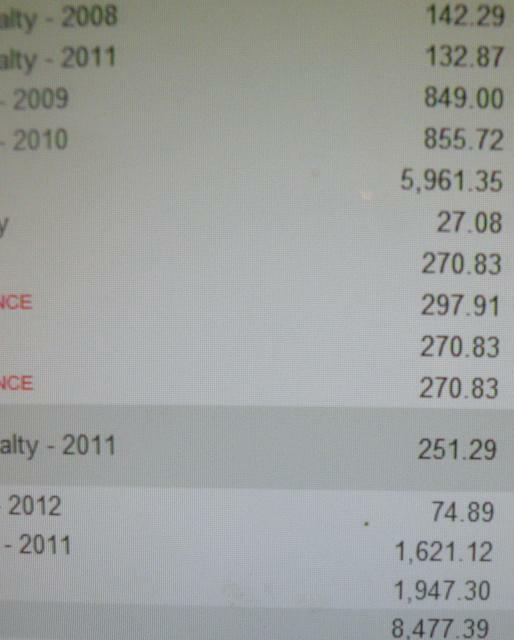 Lowes and on 11/17/11 a wire for $4,372.52 to Northwest Mechanical, Inc. for reimbursements of material costs. 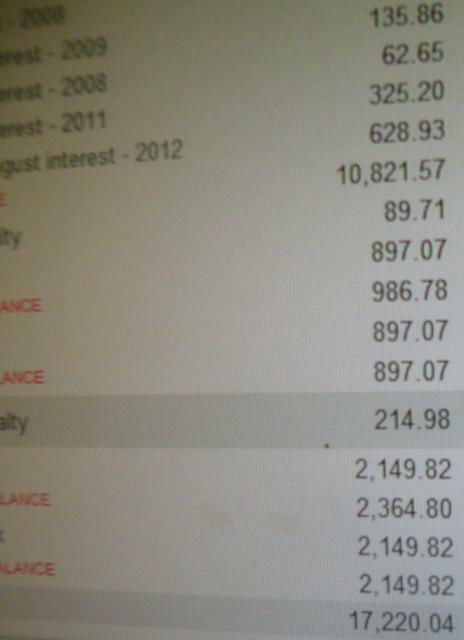 Neighborhood Action Partnership, LLC OH also incurs another $232.77 in insurance expense. 11/17/11 /1/24/11 – Attempts to contact Mr. Ennis are without response or reply. Jason Brooks provides status onRocklandrenovation as a courtesy. He never investested. 1/25/12 – I send an email to ALL Land Bank and Escrow parties stating that SARTRE, LLC has not released Northwest Mechanical from our agreement. 1/26/12 – At a distinct contractual disadvantage with and having no legal way to prevent a sale of 18801 Rockland Ave. AND Mr. Ennis’ intentions of breaching contract clear, I send an email including all accounting of funds to Mr. Ennis stating that, “My investment capita and time are not free,” and that I will concede to a “principal plus interest at 10% per annum” resolution. 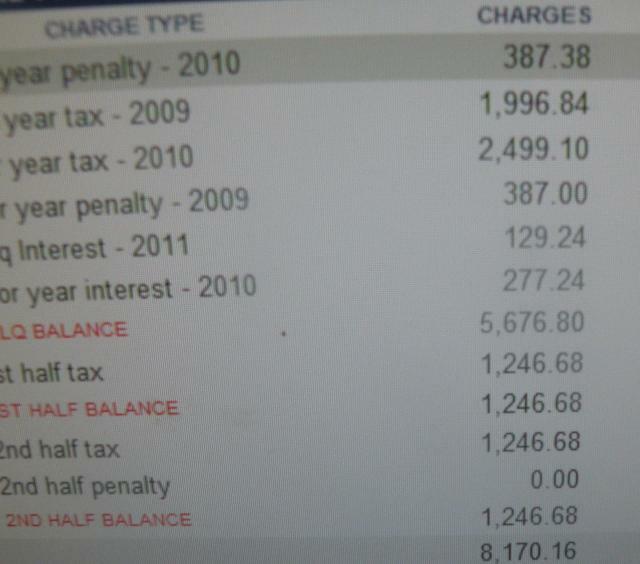 1/28/12 – I respond to Mr. Ennis’ email with a new accounting of funds, adding insurance expense. 02/22/12 – Mr. Ennis’ reply states, “Please advise out of town , will call t.” No further communication (or promised funds) are received from Mr. Ennis until a reply to a 07/20/12 email. On 02/07/12 – Without my knowledge and in breach of contract,18801 Rockland Ave.was transferred TWICE, first from the Land Bank to Northwest Mechanical. Public records indicate that two hours later the property is sold by Northwest Mechanical to Joeseph Rose for $64,400.00 via Quit Claim Deed, without a participating title agency or Purchase Contact of record. The gross profit is $64,400 – $10,731.55 = $53,668.45. 02/16/12 – I only receive an email response from Greggory A. Anglewicz stating, ”We have been advised that Sartre, LLC and Neighborhood Action Partnership are no longer part of this transaction by Northwest Mechanical. Unfortunately due to privacy laws, I can not release any information on these files to third parties without the consent of the principals.” A reply to Mr. Anglewicz asking for clarification solicits the following response. 07/20 – 08/03/12 – SARTRE, LLC has requested from the Land Bank that, given the curcumstances, Northwest Mechanical is to transfer the Deed in Escrow contract to SARTRE, LLC. As of August 31st 2012, neither Northwest Mechanical, Inc. or SARTRE, LLC (CA) has changed their position. 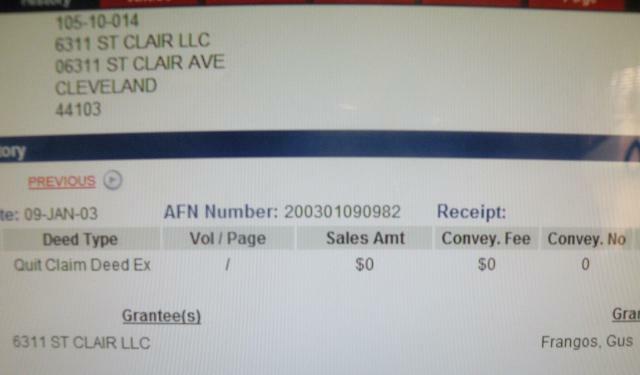 SARTRE, LLC obviously has vested interest in both properties, including 4487 W. 149thCleveland,OH, the Deed of which is still held in Escrow at Thoroughbred Title Agency,Cleveland,OH. On the next page, please find a signed and notarized copy of The Agreement between SARTRE, LLC and Northwest Mechanical, Inc. Submitted by Gone Fishin on Sun, 03/17/2013 - 20:41. Sartre LLC's complaint relative to "Screw Job Northwest Mechanical LLC" mentions funds going to Neighborhood Action Partnership LLC. 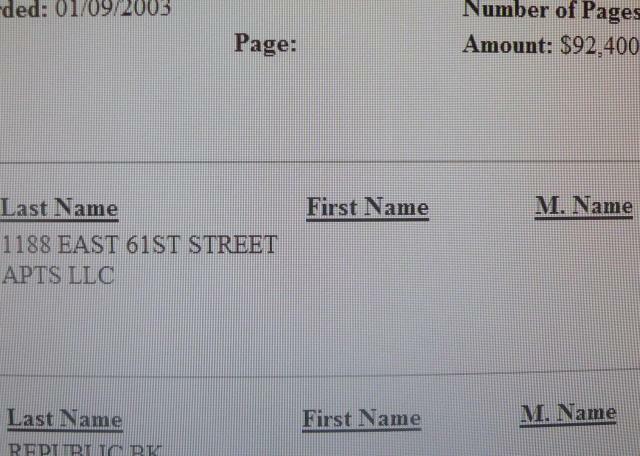 Jason Brooks from Two Aces LLC is also the agent for Neighborhood Action Partnership LLC. The top beneficiaries of land bank property are all LLCs and connected to each other. The Cuyahoga County Land Bank AND Community Development Organizations are giving or nearly giving away tax payer property so the shell LLC's can flip the property for a profit. WHY? Wonder what percentage of the profit goes to Gus Frangos and his shell LLCs??? $1,442 received to Neighborhood Action Partnership, LLC from Northwest Mechanical, Inc per agreement. Submitted by Gone Fishin on Mon, 03/18/2013 - 06:09. 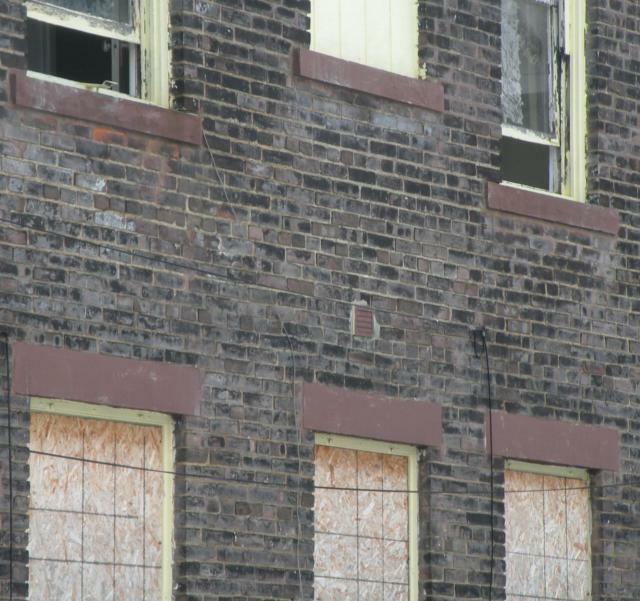 Cuyahoga County Land Bank is attempting to save county property from risky, out-of-state investors. Meanwhile county land bank officials- with the blessing of Gus Frangos, the biggest screw job and con artist in town- has decided to selectively give away or nearly give away property to risky out-of-state investors. "Safe Appealing Returns in Today’s Real Estate (SARTRE, LLC), a Bulk R.E.O Real Estate fund which offers investors an astounding 27% Preferred Return by purchasing and selling foreclosures in bulk, nationwide." The same exact investors in which the county land bank was formed to protect us are the main receipients of land bank property. The same 'flippers' that the county land bank was so concerned about are making a profit from taxpayer's property. Reside in Cuyahoga County or designate a local agent authorized to accept notice on behalf of the purchaser if non-Cuyahoga resident. then they MAY qualify for the Straight Sale Program. Under this program, the purchaser must demonstrate a proficiency in renovations through references, photos, legal documents, etc. The straight sale is similar to any other real estate transaction except that the Land Bank does require that property get renovated to a certain standard of quality. If the potential purchaser has NOT previously completed a successful renovation, they must go through the Deed-In Escrow Program. Not one single peep from Jackson's mouth until re-election time. I hope voters are smarter this time around. County Executive Ed Fitzgerald is too busy plotting his next job. He can't stay put in one job long enough to do the job in which he was elected. I hope voters are smarter this time around also. Both Ed Fitgerald and Mayor Frank Jackson have an obligation to those that were foolish enough to elect them. Submitted by Gone Fishin on Mon, 03/18/2013 - 17:48. On April 13, 2012, Kamms Corners Development GAVE the property located at 14724 Grapeland to "Screw Job" Northwest Mechanical. The agents for "Screw Job" Northwest Mechanical- Theodore and Jeramy Ennis use the address of 3001 Monroe, Cleveland, Ohio. According to the Cuyahoga County Land Bank rules, these screw jobs are NOT ALLOWED TO PURCHASE -OR RECEIVE FOR FREE -PROPERTY FROM THE COUNTY LAND BANK WHEN THEY ARE TAX DELINQUENT. Submitted by Gone Fishin on Tue, 03/19/2013 - 04:22. Jason Brooks and his numerous LLCs sure are keeping me busy. He reminds me of Gus Frangos and his numerous shell LLCs. I wouldn't be surprised if Jason isn't partners with Gus Frangos. Jason Brooks is named agent and/or incorporator for Bysns Group LLC, AMERICAN ASSETS GROUP, LLC, BD CLEVELAND INVESTMENT, LLC, BISKAT USA, LLC, DC REAL SOLUTIONS LLC, EXTREME INVESTMENT LLC, ML CLEVELAND INVESTMENT, LLC, MR CLEVELAND INVESTMENT, LLC, NATIONAL ASSET GROUP - NAG, LLC (NATIONAL ASSET GROUP, NEIGHBORHOOD ACTION PARTNERSHIP LLC, RF CLEVELAND INVESTMENT, LLC, RR CLEVELAND INVESTMENT, LLC, SARTRE FOUR, LLC, SARTRE, LLC, THE BYSNS GROUP LLC, TWO ACES RE MANAGEMENT, LLC, TWO ACES, LLC, YDE CLEVELAND INVESTMENT, LLC, YF CLEVELAND INVESTMENT, LLC, YS CLEVELAND INVESTMENT, LLC, THE JLR GROUP LLC, LB PROPERTY MANAGEMENT GROUP LLC. ALL of the LLCs were created since 2010. Several of the LLC's are getting lots of property from the county land bank and community originizations. Jason Brooks is well connected and his name appears on numerous land bank transactions. Submitted by Caught1 on Fri, 03/01/2013 - 04:50. I thought one of the main purposes of the county's land bank was to keep property out of the hands of out-of-state investors. Turns out the County's Land Bank and other community organizations are literally GIVING away property to an out-of-state investor based out of Florida. "Giving away" as in FREE. Submitted by Gone Fishin on Tue, 03/19/2013 - 05:11. More than likely the lawsuit involves around T J Dow's charter school- Dow Leadership Institute. Part of the dispute is contractors- including Jason Brooks and Jeramy Ennis- alleging that they were not paid for the work performed on T J Dow's school. I believe the county uses Jason Brooks and Jeramy Ennis as contractors for land bank property since their names have come up repeatedly for contracting work involving the land bank. I also believe the community development organizations use both Jason Brooks and Jeramy Ennis as contractors since mechanic's liens were filed relative to unpaid work for Old Brooklyn Development and another development corporation ( I forgot which one), and their names have came up several times as contractors during my research. 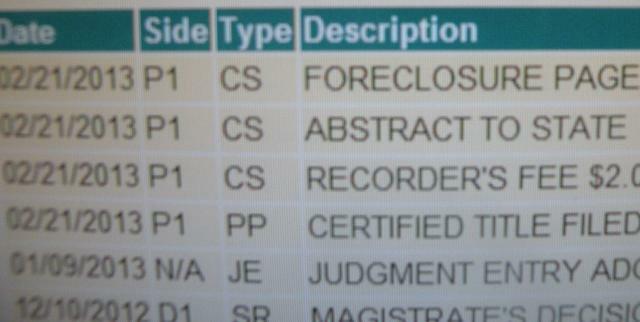 Jason Brooks was named as a defendant in four foreclosures in Cuyahoga County. Three foreclosures were successful and the third was dismissed at plaintiff's request after the judgment was granted. Submitted by Gone Fishin on Fri, 03/08/2013 - 06:33. 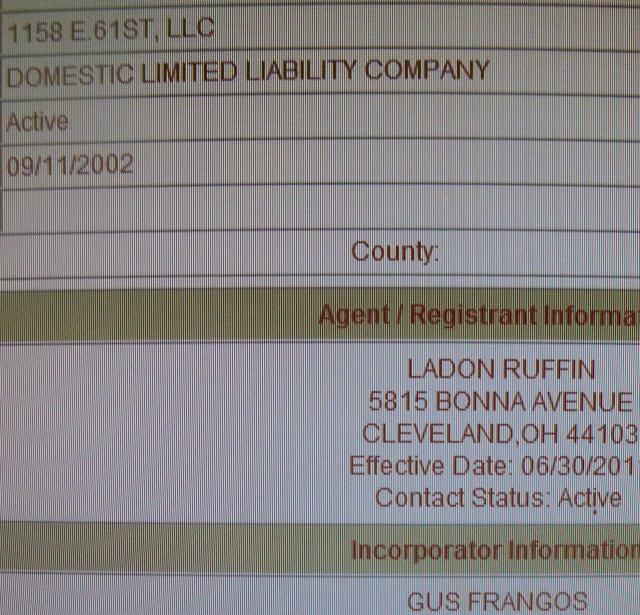 And the tax mailing address is Gus Frangos' personal address in Hudson, Ohio. And Gus Frangos signed the mortgage. Although Gus Frangos is highly praised for 'writing the book' on delinquent property taxes and tax foreclosures, he obviously never read the book. Despite not paying property taxes for several years and owing a large amount of delinquent property taxes, this property was never sold to the tax lien predators. I suppose if I were up to no good and had a job in the Cuyahoga County Treasurer's office - which has the sole ability to pick and choose which delinquent property tax liens to sell- I wouldn't sell myself out either. However, all good things must come to and end. Gus Frangos no longer works for the County Treasurer and 1158 East 61 will now be sold to the highest bidder at a sheriff foreclosure sale in the near future. Gus Frangos is a con artist. A con artist in charge of all of Cuyahoga County taxpayer's property. A con artist hiding property behind numerous LLCs, obtaining large mortgages and failing to repay the loans, NOT paying property taxes, all while collecting rent money from several rental units. Gus Frangos is also a hypocrite. A hypocrite writing and passing legistlation to target others who have NOT engaged in such fraudulent activity. 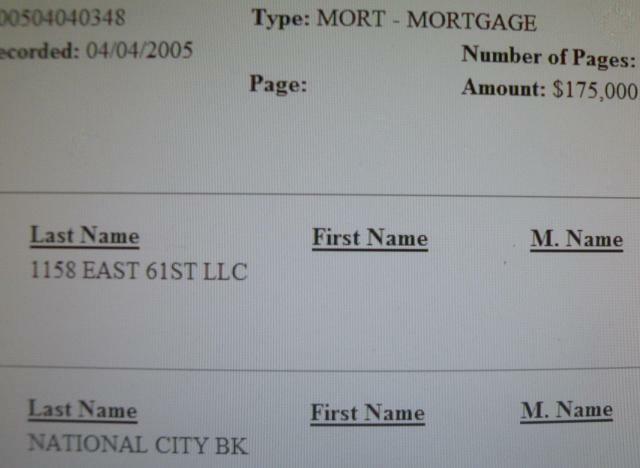 I believe this case meets the defintion of mortgage fraud. Gus Frangos has to GO. Submitted by Gone Fishin on Sat, 03/09/2013 - 21:27. 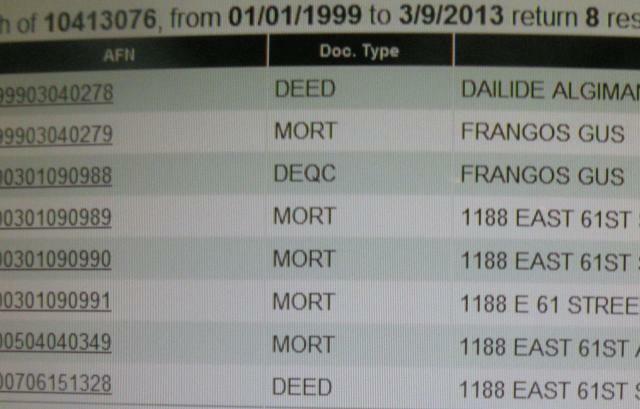 The deed transferred to Carl and Michelle Dallas and sold for $169,000. Submitted by Gone Fishin on Sun, 03/10/2013 - 19:10. Gus Frangos purchased the property located at 907 East 70th Street and transfers the deed from his name to Quinn Court Properties. 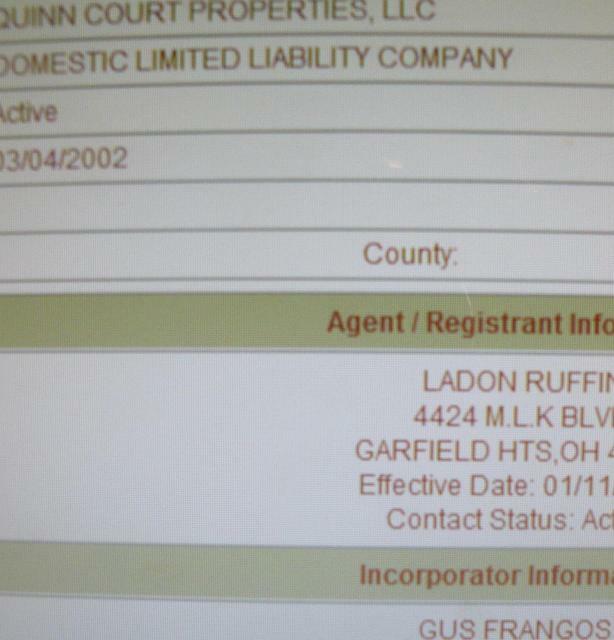 Gus Frangos incorporated Quinn Court Properties and named Ladon Ruffin as his agent. 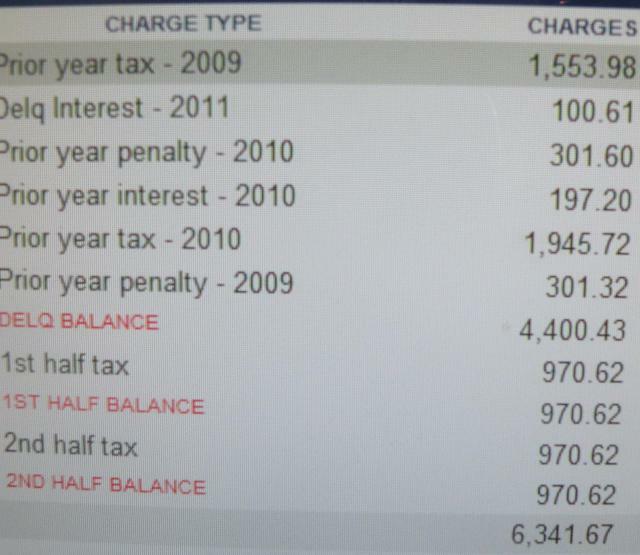 Property taxes were not paid for years until very recently for this property. No tax lien sold to the predators. Quinn Court Properties also own the property located at 913 and 917 East 70th Street. 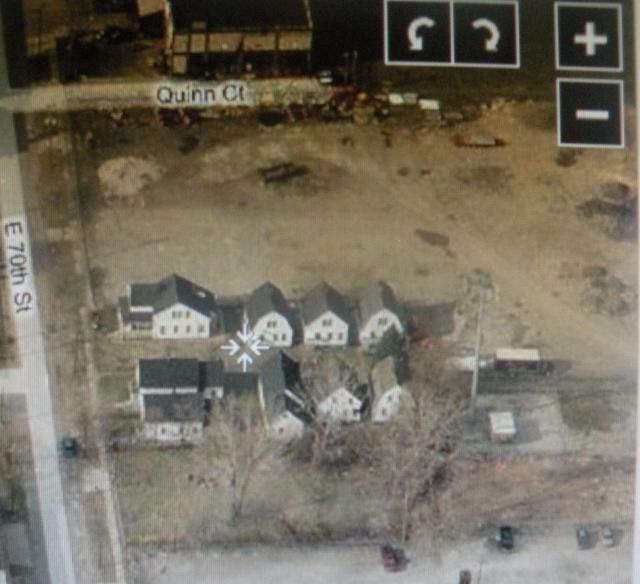 According to the mortgage documents, Quinn Court Properties LLC also owns property located at 7009-7015 Quinn Court -directly behind these properties. I am not able to locate these properties in the fiscal office to check for delinquent property taxes. No information appears for Quinn Court. It appears Cuyahoga County was assisting Gus Frangos with his development in this area. Submitted by Gone Fishin on Sun, 03/10/2013 - 20:32. 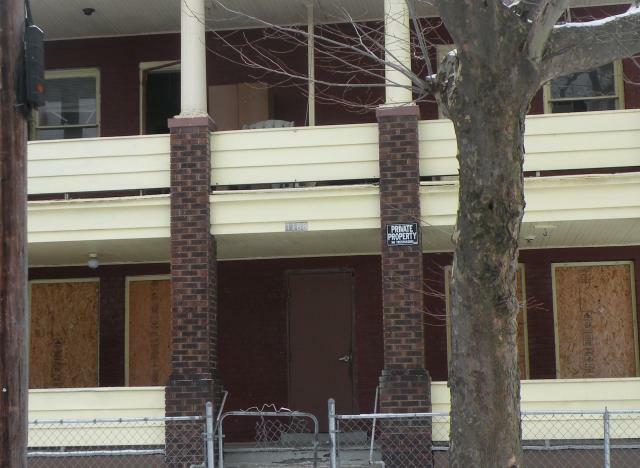 There were two foreclosures filed against Quinn Court Properties and Gus Frangos, Case Nos. CV 11 766581 and CV 11 766519. I believe one was for the properties on East 70th Street and the other was for the property on Quinn Court. Submitted by Gone Fishin on Mon, 03/11/2013 - 19:02. It was an EMERGENCY for city and county officials to sell land bank property to Hamdi " Sam" Qasem, who is next in line to be sentenced for county corruption. Such an EMERGENCY that Qasem failed to pay taxes for YEARS on this property after he stole it from taxpayers- with the asssitance of corrupt thieves that are in charge of taxpayer's property. By Councilmen Lewis, Melena, Cimperman and Patmon (by departmental request). and located at 5820, 5816, 5810 Superior Avenue to Hamdi ÒSamÓ Q a s e m .
of Committees on Community and Economic Development, City Planning, Finance. The rules were suspended. Yeas 21. Nays 0. Read third time in full. Passed. Yeas 21. Nays 0. Qasem, 55, spends most of his time in Florida but still owns a house in Westlake and some commercial properties in Northeast Ohio. For years, he owned several gas stations and food and beverage stores in Cleveland. He also spoke out on the need for closer relations between the city's Arab and Jewish communities and the dangers that convenience-store owners face. Qasem is a good friend and business partner with Samir Mohammad, a top aide to County Auditor Frank Russo. Russo, who also employed Qasem's son Haddi for eight years, and County Commissioner Jimmy Dimora are prime targets of the federal investigation. Submitted by Gone Fishin on Sat, 03/09/2013 - 09:30. A review of court records by The Huffington Post turned up more than 50 homeowner lawsuits against banks and the two largest property management contractors in the U.S., Safeguard Properties and Lender Processing Services, stemming from break-ins of occupied homes. The allegations follow five years of generally woeful management of the foreclosure industry by all involved, as the inspector general for the Federal Housing Finance Agency, which oversees Fannie Mae and Freddie Mac, is raising red flags about the lack of contractor oversight by the government-backed mortgage giants. Safeguard is an illegal scam, breaking into properties, cleaning them out using false clamims that the property has been abandoned. They are simply put thieves. All we the contractors want from Safeguard is the money that they owe us, nothing more, nothing less. They see fit to change the rules all the time, leaving us out of the loop on their new policies therefore it halts our paychecks, because they are making them up as they go along. They have a different staff and management every other week, and nobody seems to know what its going on. My family and I are one step away from the poor house and Safeguard is my only source of income because at my age, I cant find much else. All in all I just want my hard earned money. Its not right for them to keep this from us, who go out and do this very hard work. The banks and Safeguard seem to be above the law and do not care that alot of its employees are having their utilities cut off, have no food to eat, not being able to have Christmas, not getting checks when they are supposedly sent out, always charging people back for work orders, and the state of Ohio seems to be able to do as it pleases. Glad to see others that have the same views of Safeguard Properties, Iwas a sub-contractor for a short time and only lost a few grand. In all the years I have never been treated so poorly by any business associate ever! 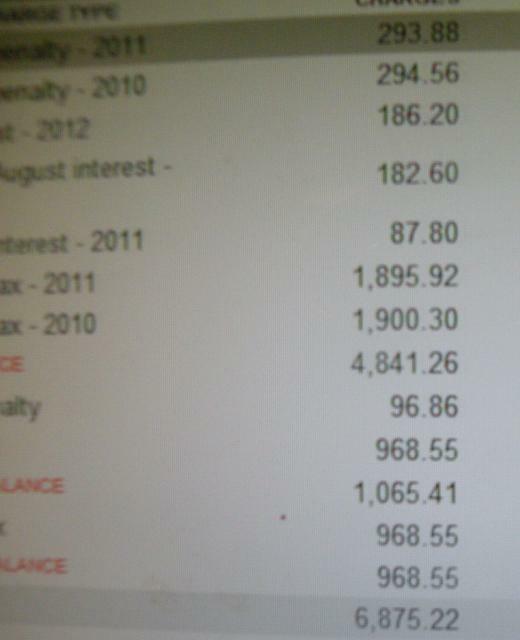 The nasty emails,phone calls, and mistakes that thier property specialists would send me were completely unacceptable. Anytime I would notice a mistake I would either be told to complete the project anyway or get scolded like a child for not completing the order in time. The people that work in that organization are miserable humans who pass on the anger they receive from management onto the subs out in the field. When I finally decided I had enough, they convinced me to complete the last three projects that I was assigned, I agreed and guess what - I received three checks for $1.00 each - these people are evil!! The whole industry needs to be brought to light to the media, news, talk shows, so that some of these illegial practices by companies such as Safeguard gets notice. We own a small business in Chattanooga, TN and perform property preservation services all over TN and North GA. We primarily do work for Safeguard Properties, Inc (based out of Cleveland, OH) and have since 2004. In September 2005, Safeguard asked us to perform rehab services on several houses in Tennessee for the victims of Hurricane Katrina. We performed the work on the houses here to the tune of $55,000 worth. Since then, we have not been paid for our services due to one excuse after another from Safeguard. We are not the only contractors that have heard the non-ending excuses about how HUD hasn't paid Safeguard, HUD is requiring receipts for every little thing - nails, paint, screws, cleaners, etc. We are just a husband and wife with 6 kids....we have laid off all of our contractors - at one point we had 25. We have lost all of our personal real estate investments due to not getting paid. We are being forced to close our business due to all of this. Submitted by Gone Fishin on Sat, 03/09/2013 - 18:03. Well, Safeguard Properties recently announced an exciting new partnership where they are formalizing relationships with our local governments…..A MOST DANGEROUS DEVELOPMENT! FORECLOSURE COCKROACHES- Jack Booted Lender Thugs That Break Into Homes- IT’S A CRIME! DO NOT HAVE ANY RIGHT TO STEP ONE FOOT ONTO A HOMEOWNER’S PROPERTY–THAT IS TRESPASSING! The reason I call them Foreclosure Cockroaches is because they are so hard to find…they scurry away whenever approached and we cannot find out who they are or what they are doing. I have several cases from across the state. I am in dialogue with high ranking officers in one law enforcement department in this state who are not convinced this is a crime. (Despite the fact that their own State’s Attorney’s Office is.) Please help me gather and share information about this phenomena. Please post your stories on this blog…please share dates, times, addresses and names of people, lenders, companies that are involved. Let’s shine a light on these cockroaches. This sticker posted on the door of an American’s castle should not be grounds to tear up the Constitution, trample the flag, break down the doors in homes across this county. Submitted by Gone Fishin on Sun, 03/17/2013 - 16:08. This is a tracking system that has been set up to monitor and track non-payment issues. Also you all may want to Contact the NPPG as both organizations have gone to bat for the little guy. The fact the Safeguard will only work with companies that are willing to cover areas larger than they are capable of covering properly only opens the door to the scammers, ripoffs, and unscrupulous characters, in addition to promoting substandard workmanship. If you are having issues with companies subbing their work then PLEASE go submitt your information in these data bases and also sign up for the mailing list so you can receive updates on industry news. After unearthing literally hundreds of thousands of dollars swindled from Contractors by Order Mills, Forelosurepedia has elected to publicly open up its ISTAR Database.